Naturalized in California and Arizona. Adventive (possibly naturalizing) in Victoria, Australia. Naturalized in six counties in California as well as Arizona and Australia. In California, present in coastal scrub, chaparral, and disturbed sites. In Western Australia, naturalized in valleys, near salt lakes, along track edges, in disturbed woodlands & agricultural sites. Riefner, R. E., & Boyd S. (2007). NEW RECORDS OF WETLAND AND RIPARIAN PLANTS IN SOUTHERN CALIFORNIA, WITH RECOMMENDATIONS AND ADDITIONS TO THE NATIONAL LIST OF PLANT SPECIES THAT OCCUR IN WETLANDS. Journal of the Botanical Research Institute of Texas. 1, 719–740. Several other species in synonym genus Matricaria are listed by Randall 2012. 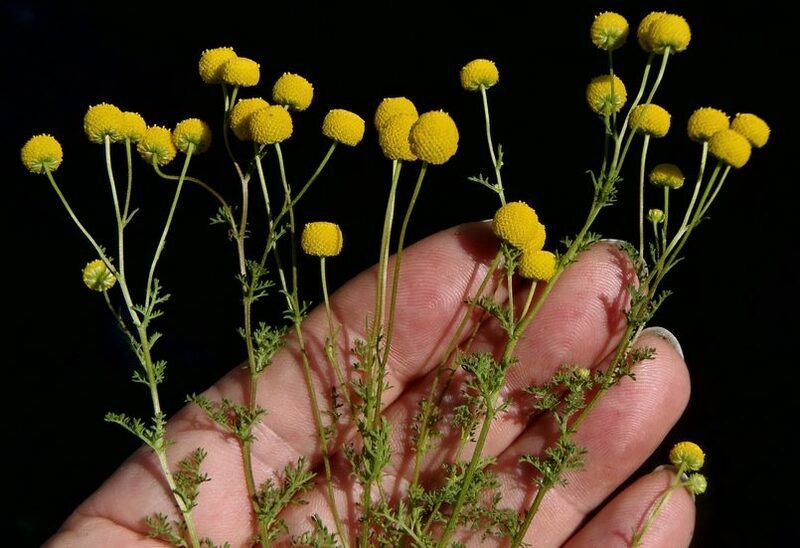 Pineapple weed (Chamomilla suaveolens, syn. to Matricaria discoides) is a weed of crops, gardens, etc. Cannot find any information on this so defaulting to no. Used as a medicinal plant to treat fevers and other ailments. Pillay, P., Vleggaar R., Maharaj V. J., Smith P. J., & Lategan C. A. (2007). Isolation and identification of antiplasmodial sesquiterpene lactones from Oncosiphon piluliferum. Journal of Ethnopharmacology. 112, 71–76. Grows 15-45 (sometimes 70)cm tall so unlikely to produce a stand that would be considered impenetrable. No indication of vegetative reproduction. Flowers March to July in California. I am extrapolating this to more than three months. A journal literature search found only four references, one noting this species from riparian habitats in Southern California. Native to South Africa, but there is no information on the PlantzAfrica (South African native plants) website.